Heinrich Daniel Schleicher was born in Norka, Russia on June 26, 1856, the son of Adam Schleicher (born 1825) and Eva Elisabeth Brehm (born 1826). Heinrich married Anna Elisabeth Jost (Yost) on March 29, 1877 in Norka. Anna Elisabeth was born on August 17, 1857, the daughter of Conrad Yost (born 1825) and Anna Maria Bott (born 1827). Heinrich and Anna Elisabeth immigrated to the United States in 1878. They sailed from Hamburg, Germany on May 22nd and arrived in New York on June 5th aboard the steamship Wieland with two children; Elisabeth (9 years old) and Katharine (11 months old). The 1880 U.S. Census states that Elisabeth is the sister of Heinrich. Katharina is the daughter of Heinrich and Anna Elisabeth. Many more Volga German families were also onboard this ship. Heinrich (now Henry D.) and Anna Elisabeth (now Anna or Emma) initially settled in Nebraska. In 1880, they were living Sheridan County and Henry worked as a farmer. Four sons were born in Nebraska; John (about 1878), Daniel (about 1880), Harry (about 1884) and William John (about 1886). It appears that Henry and Anna separated by 1891 as Henry had migrated to Portland at this time. Anna died in February 1915 in Lincoln, Nebraska. No mention is made in her obituary of her husband, Henry. 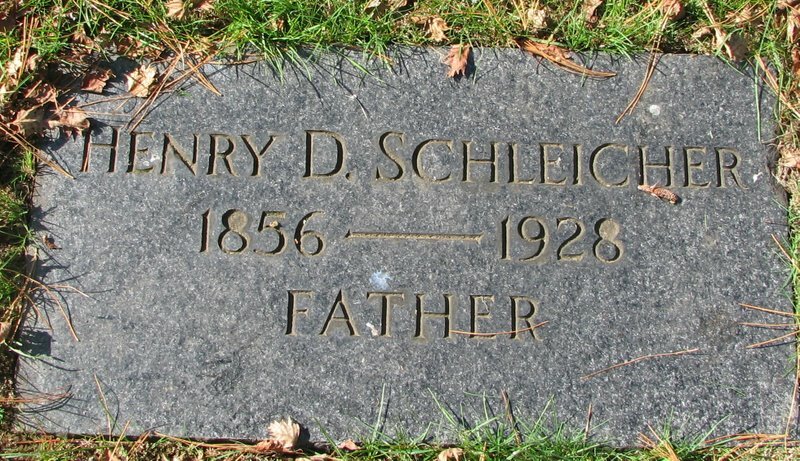 There are no other Schleicher's buried at the Laurel Hill Cemetery with Anna. Henry was the paternal first cousin of George Schleiger, another early Volga German settler in Portland. It is possible that they came to Portland together as both were men single at the time. By 1910, Henry is listed in the census as a "widower" and works at a local Portland sawmill. He was boarding with the Adam Deines household at 405 Knott Street in Portland. In 1917, Henry's son William declared on his draft registration card that his father was solely dependent on him for his care. In 1920, Henry was living with the Peter and Katharine Elisabeth Repp family in the St. Johns area of Portland. He is shown as "father-in-law" (the father of Katharine Elisabeth). Peter is the son of Peter Repp and Elisabeth Döring. Henry died on May 17, 1928 and was buried at the Rose City Cemetery in Portland. Henry's son, William John Schleicher (1886-1946), is also buried at the same site.